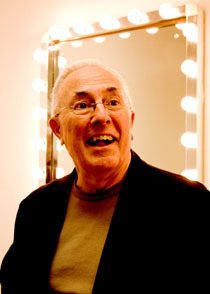 Composer Michael Gibbs and U.S. guitar virtuoso Bill Frisell had a triumphant concert with the great drummer Joey Baron and the BBC Symphony Orchestra during the London Jazz Festival late in 2009, performing some of Gibbs' classic compositions and a specially commissioned work, Collage For A Day. They both hope to do more performances together in the near future, and in the meantime are busy with their own separate projects. At the time of the interview, Michael was looking forward to the release of a new album, Here's A Song For You, which he arranged and conducted, and which features the marvellous singer Norma Winstone with the NDR Big Band from Germany. It's now out on the Fuzzy Moon Records label. The London Jazz Festival concert was recorded at the Barbican for broadcast on BBC Radio Three, and I spoke to Michael and Bill in the guitarist's dressing room, starting by asking how the joint venture came about. Bill: 'I was aware of Michael's music long before he was aware of mine, of course. I first heard his music in the 1960s, and became a big fan way back then. So for me, we're talking about more than 40 years ago. When I first heard his tunes, I thought " What is that sound? Where's that coming from?" 'And then 10 years after that I went to Berklee in Boston as a student and was lucky enough to get him as a teacher. I took all of his classes at Berklee, and played in the student band. Not long after that he asked me to do a tour in England, so for a long time his music has been a big part of my life. 'It's really a dream come true to be able to do this. So much of the way I think about music has come from this association. It didn't all come from Mike, but there's so much in the way I put it together . . . the way I think about harmony and the way the notes fit together, I've learned so much from him, and it's just so infused in my work. 'It's a mystery to me what he does with music, but he's inspired me for so long. Michael: 'It's such a long time since I first heard Bill at Berklee - I vaguely remember you in a class, Bill, it was only when we started working together later . . . I mention that Michael has always written strongly for the guitar - with soloists in earlier times including Chris Spedding (on albums including the live doube LP Just Ahead), Philip Catherine (on The Only Chrome Waterfall Orchestra) and John Scofield and Kevin Eubanks as well as Bill (on Big Music) . Michael: 'You know that on Big Music I've got five guitars: Bill, John Scofield, Kevin Eubanks, Dave Fiuczynski and Duke Levine. Sometimes I had Duke and Dave chomping away, and it's so rhythmic, it's so exciting, and then to put the soloists on top . . . I mean Bill, John and Kevin play the same instrument but they play nothing like each other. 'Three incredibly different musicians, the sound they make. I really liked having five guitars on that album. But I don't think of myself as necessarily writing for the guitar - more for the individual musician. I asked Michael about his approach in writing for a string orchestra, compared to writing for a big band. Michael: 'I've had a lot of experience of writing for orchestra in films and commercial music. In [Michael's ballad composition] Sweet Rain there are two chords that sound so Hollywood - I know it's syrupy but I love it! Gary Burton took that tune to Stan Getz when he was working with him, which was really fortuitous for me. 'In my first recording of Sweet Rain [on the 1970 Deram album simply called 'Michael Gibbs'], I speeded it up in places, changed the key at the end. 'I heard Bill play it two years ago at the Cheltenham Jazz Festival, and then recently in Bilbao. It was when I heard him playing it in Bilbao that I thought I must include it in this concert with the BBC Symphony Orchestra. At the Bilbao concert it was so tenderly played, and I realised it would be really appropriate to do it again. 'I was orignally going to do [the Duke Ellington composition] Solitude, but Sweet Rain seemed appropriate. 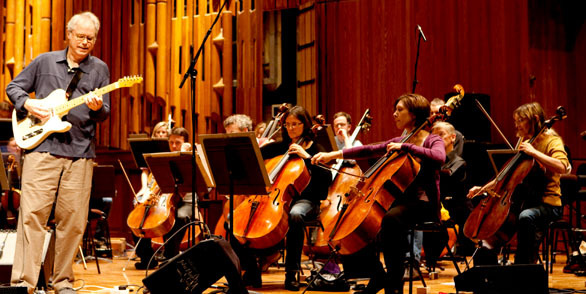 We're hoping to do some more, perhaps on other gigs with other orchestras.